It remains one of my favorite Neil Diamond songs. It had introspective lyrics combined with up-tempo and catchy music. It just continued to build as the song progressed and included one of the better vocal performnces of his career. How it did not become a hit I will never know. Taken from the album, VELVET GLOVES AND Spit, it was released as a single during the summer of 1968, it stalled at number 66 on the BILLBOARD MAGAZINE Hot 100. 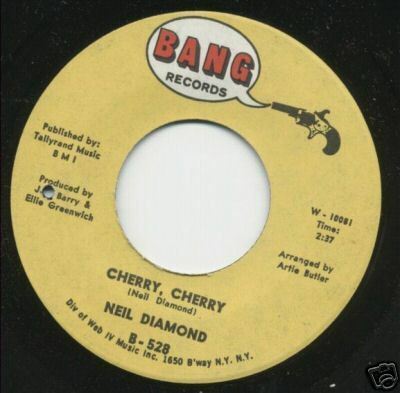 After five years of struggle, Neil Diamond finally hit the big time when he signed with the Bang label in early 1966. His first four singles all reached the BILLBOARD MAGAZINE Hot 100 with three reaching the top 20. All were up-tempo pop/rock songs with catchy hooks. He went in a different direction with his fifth single for the label. “Girl You’ll Be A Woman Soon” was his first true ballad to become a hit. Released during early January of 1967, it reached number ten on the Hot 100. It was the first of dozens of ballads that would define his career. 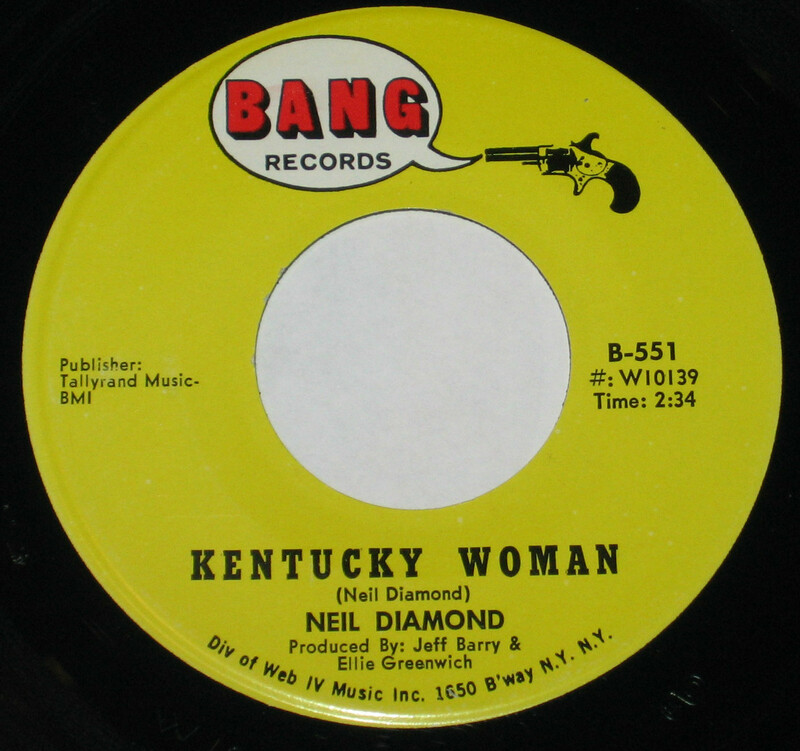 Neil Diamond first recorded in 1960 and spent a number of years without any commercial success. That all changed when he signed with the Bang label in 1966. His first chart single, “Solitary Man,” was a minor hit reaching number 55 on the BILLBOARD MAGAZINE Hot 100. His second release for the label was the first big hit of his career and set him on the path of becoming one of the most successful male artists in music history. “Cherry Cherry” was an up-tempo rock/pop tune released during the summer of 1966. It peaked at number six during its 12 weeks on the chart. During March of 1973, the song reappeared as a live track pulled from his HOT AUGUST NIGHT album. It reached number 31. It remains a part of his stage act. All careers have to start somewhere. 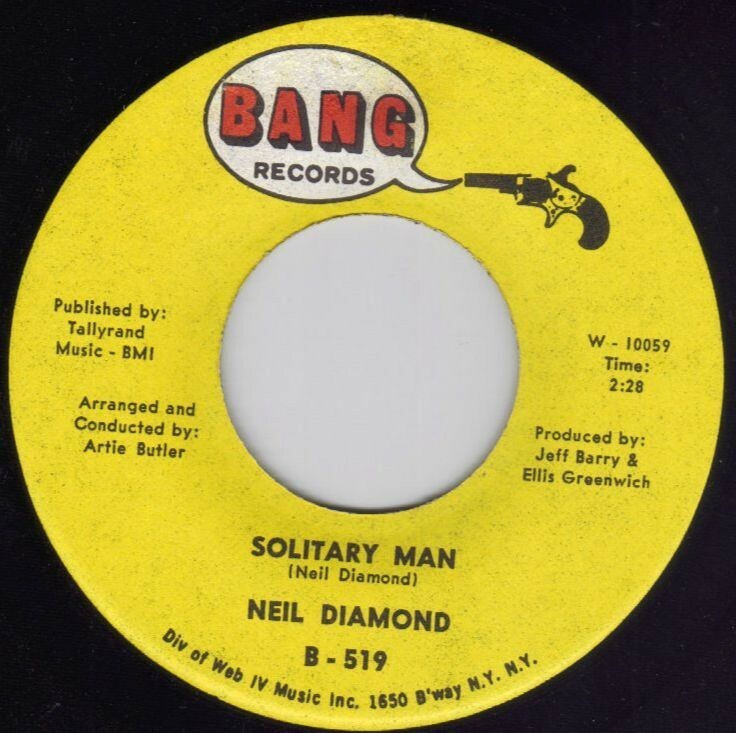 Neil Diamond began writing songs during the early 1960s but “Solitary Man” was the first chart single of his career under his own name. 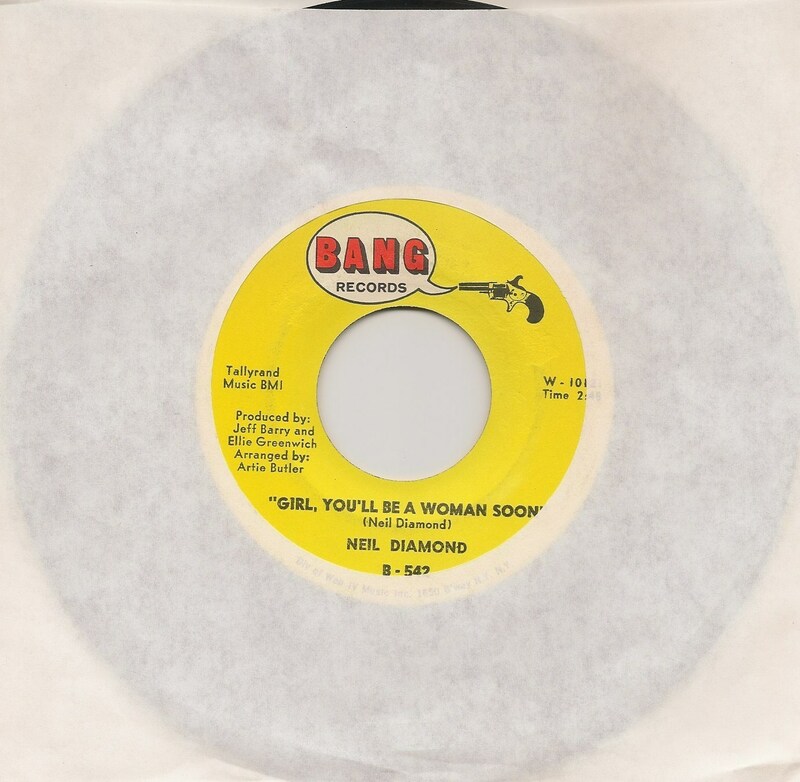 Diamond was signed to the Bang label and released “Solitary Man” during early May of 1967. It peaked at number 55 on the BILLBOARD MAGAZINE Hot 100. It may not have been a big hit but 55 more chart singles would follow making him one of the most successful male solo artists of the rock and roll era. 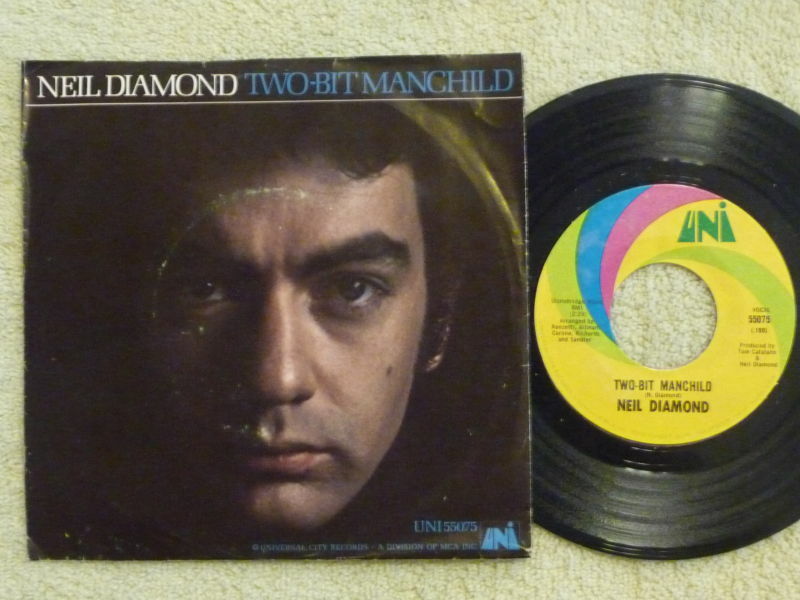 Today Neil Diamond is mainly remembered for his pop and easy listening hits but during his early career he could actually rock a bit now and then. During the summer of 1967 he rocked with the top 20 hit, “Thank The Lord For The Night Time.” He followed that hit with “Kentucky Woman,” which first reached the BILLBOARD Hot 100, October 14, 1967. It peaked at number 22 during its eight weeks on the chart. The song returned to the top 40 a year later courtesy of Deep Purple. Neil Diamond placed 56 songs on the BILLBOARD Pop Singles Chart, 1966-1988, but none so enjoyable as his early rock hits. 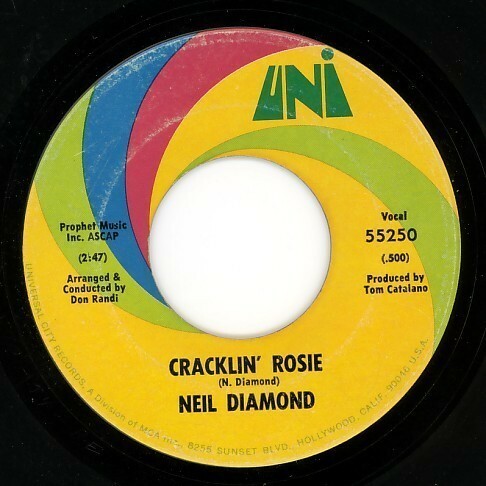 Neil Diamond had sold tens-of-millions of albums and charted 19 singles before he released “Cracklin’ Rosie” during the summer of 1970. It would become the first number one song of his career as it topped the BILLBOARD MAGAZINE Hot 100 Singles Chart for one week. During its 15 years on the chart it sold over one-million copies. It was a smooth up-tempo pop song that was typical of many of his hit singles. It remains one of his signature songs. Neil Diamond was not a huge star in 1968 but he had gained some attention with a series of hit singles for the Bang Label. During late 1967, he informed the label that he would be leaving and they responded by releasing just about any material they had in the vault as singles. 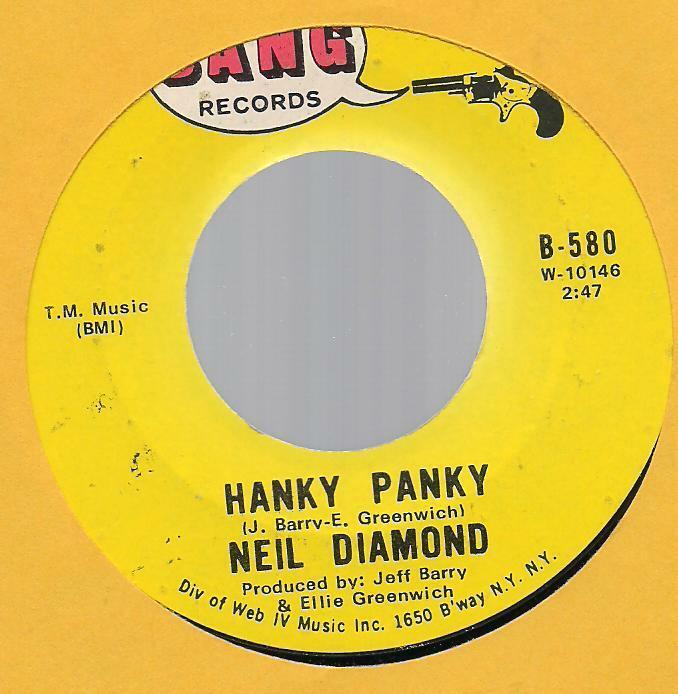 “New Orleans/Hanky Panky” was released January 6, 1968. While “New Orleans” was considered the A side, but many radio stations flipped it over and played “Hanky Panky.” It may have been due to the familiarity of Tommy James’ number one version. “Hanky Panky” reached number 51 on the BILLBOARD MAGAZINE Pop Singles Chart during its six week stay. While it may not have been one of his better efforts, it was a bridge to his time with the Uni Label, where he would become a superstar. You are currently browsing the archives for the Neil Diamond Reviews category.